You’ve bought a beautiful summer dress, are excited about your holidays and then suddenly realise that your arms aren’t as toned as they once were. In fact if you’re honest, they’re a little bit flabby. So how can you achieve killer arms in a short space of time? With the following 3 simple but regular exercises you can tone up flabby arms in no time at all and look great in that dress. You’ll need some 2kg and 3kg weights and even if you’re a regular gym goer, having these at home are a great investment which you’ll get lots of use out of. Lie on your back on a mat, arms extended straight up to the sky, holding the 2-3 kg weights (make sure the weights are clear of your face). Bend the elbow to a right angle, being careful to avoid the face area when the arms are bent. Extend and bend the arms, keeping the movement controlled. Do this for 10 reps if you are a beginner and, if you can, make it 3 sets of 10. Once you have mastered this, increase your reps to 3 sets of 15. Breathe out on the extension and keep the whole movement controlled. On all fours, with knees comfortable on a mat, take the 2 or 3 kg weight in one hand, with the other hand on the floor to support the body. 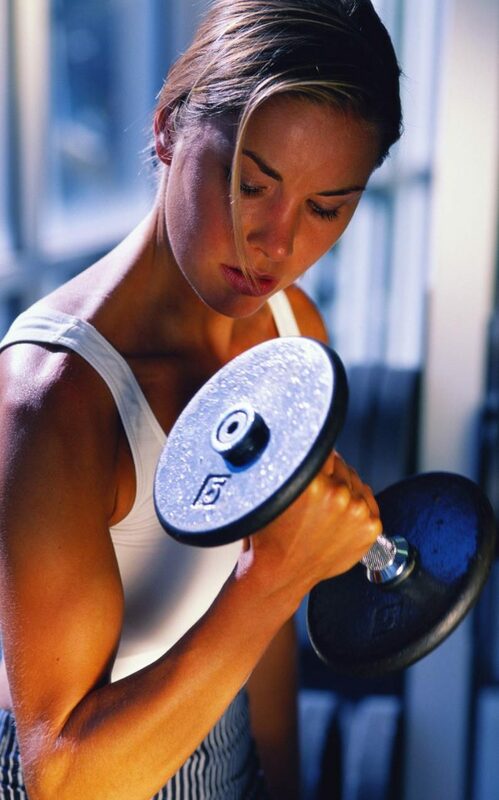 Lift the elbow up behind you, with the weight in a soft grip and extend the arm back. Again aim for 10 reps first working towards 3 sets. Once you are stronger you can aim for 3 sets of 15 reps.
It’s really important to keep the core engaged to support the back. Keep the arm movement nice and controlled and don’t forget to breathe when you extend the arm. This is one of my favourite exercises and you can do them absolutely anywhere: on a chair at home, a low windowsill or a bench in the gym or park. Sit on the chair or bench with your hands behind you, placing the hands flat on the chair taking the weight off your bottom. Lift your bottom off the seat, keeping the shoulder blades together and the chest pushed out, then dip the body bending the elbows, to drop your bottom towards the floor. Then extend the arms to a straight position. That’s 1 rep. Do this 10 times with a 20-second rest in between and repeat again until 3 sets of 10 are completed. Keep the elbows directly behind you, chest pushed out, breathe when you extend the arms and keep the core engaged, remembering to keep the movement slow and controlled. For an advanced version, extend the legs so they are straight. The weight will be distributed differently with the extended legs so the exercise will automatically feel much harder. Again, aim for 3 sets of 10-15 reps.
After doing these exercises you will need to stretch out your triceps to stop them hurting too much. Stay away from any alcohol: the back of the arm is one of the places that shows if you’re indulging in that nightly glass (or three) of wine. Breakfast: Ditch the cereal: go with Greek yogurt and berries, throw on some toasted hulled hemp seeds with chia seed or go with eggs any way you like them. Just try not to have a slice of toast with your eggs. Lunch: Quick and easy: hot-smoked salmon slices encrusted with cracked black pepper, mustard and dill with watercress and rocket salad. A splash of olive oil and a big squeeze of lemon and it’s good to go! This lunch is jammed with protein, vitamin A, K and C.
Evening Meal: Fancy some chicken? Indian spiced chicken skewers with lemon, served with a crispy salad of radish, thinly sliced Chinese leaves, fresh mint and coriander leaves, mixed with baby spinach. Drizzle with a yogurt, lemon and mint dressing. Have a fabulous summer and don’t forget you can always get in touch with us here at Living Retreats if you need some more advice on fitness and nutrition or if you’re looking for that all important post summer detox and recharge in September.